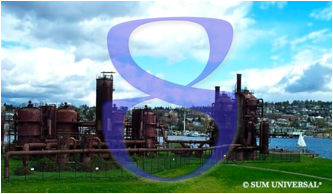 Number eight embodies the qualities of repetition, strength, and transfiguration leading to responsibility and power. Within the chemical elements exists the 'eight' or octet-rule that states that atoms tend to combine in such a way that they each have eight electrons in their valence shells (known also as outer electron shells), giving them the same electronic configuration as a noble gas. This 8-electron configuration is especially stable because with 8 valence electrons, the outer electron shells are completely filled. This rule is applicable to the main-group elements, especially carbon, nitrogen, oxygen, and the halogens, but also the metals in the first two columns of the periodic table (but not to the transition metals in the middle of the periodic table). The smallest elements hydrogen (H) and helium (He) don't follow the octet rule, but rather the "duet" rule (2 electrons), which is also a stable configuration for their corresponding molecules or ions in ionic bonding. The chemical element that correlates to number eight is the non-metallic element oxygen which makes up one fifth of the atmosphere. The human body itself consists mostly of water (2/3 of the human body is water) and water is made of hydrogen and oxygen atoms whereby nine tenths of water is oxygen. Oxygen forms compounds with almost all other elements and it's a very reactive element at room temperature therefore transfiguration takes place with the presence of oxygen. Oxygen is essential for respiration of all plants and animals and for most types of combustion. The very volatile metallic element mercury (Hg) with the atomic number 80 is the only common metal liquid at ordinary temperatures and has properties of expansion and contraction so that it can be used infinitely in a sealed container for measuring temperature change. It is a unique property for this element and attests to the symbolism of number 8 for that of repetition. The metallic element iron (Fe) with the atomic number 26 [single-digit numerical equivalent of number eight (2+6=8)] is on 8th position in row 4 of the periodic table. Iron is a vital constituent of plant and animal life, and is the key component of haemoglobin. The planet's core exists of iron. To fuse iron nuclei, or to split them apart takes either way energy. All other elements can be either fused or split apart while only the fusion or fission process requires energy. It is a unique property for this element and attests to the symbolism of number 8 for that of strength. In the presence of water or air moisture oxygen forms iron oxides molecules with iron commonly known as rust. Here we can see the unique property of strength and transfiguration working together to form a new compound.